In 2008, Google launched a research initiative codenamed ‘Project Oxygen’ to determine what qualities make a good boss. They recently came up with a top ten list, and while the results aren’t necessarily shocking, what is shocking is how often these basics are overlooked. This high-structure, high-support style of management – what I typically call ‘highly-engaged management’ – is what I have helped leaders, managers, and supervisors bring to their workplaces for more than two decades. Looking at this list, it’s easy to see that managers are the human element that connects an organization to its employees. They are the key individuals who are responsible for supporting, advocating for, and improving their team members. Someone’s boss is the person who is ultimately responsible for that person’s future and wellbeing at work. Employees today understand that better than ever. Google’s research shows that highly-engaged management is just as important now as it was when I first started RainmakerThinking in the mid-90’s! This is highly-engaged management 101 – learn to talk like a performance coach. Find out what your direct reports’ strengths and weaknesses are, and help them identify specific ways to improve. Support their learning efforts and provide as much guidance and resources as you possibly can. As I like to say, if you’re not getting stronger, then you’re getting weaker. In today’s hyper-speed workplace of constant change and uncertainty, you want your team to embrace continuous improvement in order to stay ahead of the curve. Micromanagement is always bad (when it does occur,) but don’t make the mistake of thinking that the opposite of micromanagement is no management. Hands-off, absent leaders do not empower their teams! The key is finding the right balance of being highly-engaged with employees while not taking on their tasks as your own, or dictating their every move. Provide enough information and guidance to get employees off on the right foot, and support them as needed along the way, but make sure that at the end of the day the concrete deliverables are their responsibility. When managers regularly check in with employees to track their performance, avoid pitfalls, and provide feedback, they are letting those employees know that their work is important. When a boss is so hands-off that they don’t care about performance until something goes wrong, they communicate that their reputation is more important than the success and reputation of the whole team. 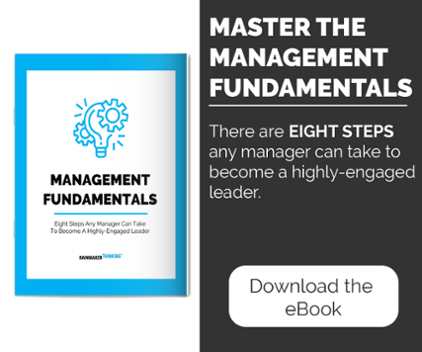 Highly-engaged managers keep their teams focused on the next goal, challenge, or obstacle and the specific, concrete steps it will take to meet that goal. While it’s important to make sure that you don’t overburden employees or treat them as machines rather than people, it can be valuable for everyone when managers leave little room for non-work-related drama or cattiness. Strong, structured communication is the key soft skill that managers need to build in order to effectively practice highly-engaged management. Being able to spell out concrete next steps and specific, measurable goals or outcomes is of course important. But listening to employees is equally as important. Managers who actively listen to their direct reports are much more likely to identify the cause of key problems sooner, avoid problems altogether, redirect performance, and provide the resources employees need to get the work done. Again, when a manager invests time and energy in the performance and careers of their employees, they communicate that those employees and their work are important. Employees increasingly value career and skill development opportunities from their employers, and providing those opportunities as an integral part of your management strategy makes superstars that much more likely to stay. This can be as simple as knowing what specific outcomes determine success for a team, and spelling out the concrete steps it will take to get there. Managers should reiterate this larger vision to their individual team members in their regular 1-on-1’s with them, tying that person’s individual performance to the overall team goal every step of the way. Managers who have done the job of those they manage are much better equipped to provide guidance, direction, and support. However, it isn’t always the case that managers understand the jobs of their direct reports from their own experience. When this happens, the successful leaders are the ones who go the extra mile to learn as much as they can about an unfamiliar job. At the least, they need to know what bad performance, average performance, and great performance all look like for that particular job, and how to measure and reward that performance effectively. Highly-engaged managers leverage their seniority, experience, and influence within the company to get what they need for their teams. A boss who uses their power for the good of their employees builds trust and becomes a go-to leader for superstar talent. Being a boss requires people to sometimes make tough calls, have difficult conversations, and determine what’s best for the group. They shouldn’t shy away from these challenging circumstances or soft-pedal their authority when it benefits them. It’s OKAY to be the boss! Nip bad performance, attitude, or habits in the bud. When low performers are allowed to hide out and collect a paycheck, high performers will start to build resentment. That drags the whole team down.